At Eastside Marketplace we pay special attention to all the particulars that make each event special. Whether it’s a delicious sandwich or deli platter for an office meeting, a kosher-style brunch, hors d’oeuvres for a cocktail party or international favorites for special occasions, you can trust our seasoned catering staff to make the food memorable. While we have over 400 different recipes in our catering repertoire, our staff is also happy to work with you to create your own idea of the perfect event. So many sandwiches and wraps to choose from…. Think of pesto chicken, peppered turkey breast, or corned beef and slaw. And the salad choices are many, including Caesar, Greek, and spinach. We can build a delicious deli platter with our choice of meats and cheeses or yours. And our kosher-style deli platter is always a winner. Schedule the event, whether a shower, Bar/ Bat Mitzvah, graduation, holiday party, or open house. The list goes on and on. 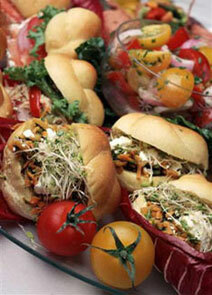 Sit back and relax, knowing your catering needs are taken care of whether for 15 or 150. No stress for you; just compliments! Think of our catering department for unique and delicious fare for your next cocktail party. We make items like phyllo cups filled with smoked salmon mousse, souvlaki chicken skewers with tzatziki sauce, and bacon wrapped sea scallops which are ideal for passing. 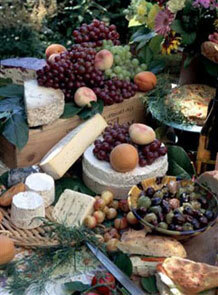 Think of an antipasto bake, herbed falafel or baked brie for stationary hors d’oeuvres. And we can help you with beautifully presented and delicious dessert platters to end the evening.